Former Albion midfielder Steve Sidwell admits the back injury which saw him miss the majority of last season could force him to retire. The 35-year-old was released by the Seagulls at the end of the season, after scoring seven goals in 68 games over two spells with the club. 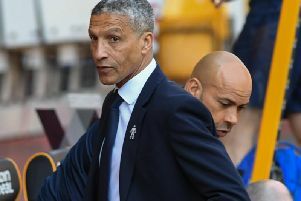 Sidwell struck five times in 12 games when on loan to Brighton from Arsenal in the 2002/03 season and then played a key role in Albion's Championship promotion-winning campaign in 2016/17, after re-joining the club earlier that year - originally on loan before making the move permanent. The popular former Reading, Chelsea, Aston Villa, Fulham and Stoke midfielder was an unused substitute in Albion's Premier League matches at home to Manchester City and away to Watford last season but did not make a single appearance. Speaking on talkSPORT this morning, Sidwell admitted he may now have to hang up his boots. He said: "I parted ways with Brighton on good terms at the end of last season and it's up to me now. “I had minor surgery just after the end of the season to hopefully clear up this back issue I’ve had, which kept me out for the majority of last season. “The surgery went well. I’m in rehab stages at the moment and we’ll see how it goes. But if I’m honest, I think this could be me done. “There will always be an element, no matter if I was 45 or 55, where I’d be saying I could still play. A footballer always has that in them. “But for health reasons and for family enjoyment, I really need to reflect on it." Sidwell will look to stay in the game if he does retire and has already done his coaching badges: “I’ve done my B-Licence and I’ve literally completed my A-Licence, so the coaching side of it will be ticked off and that could be something I will possibly go into.